Ben Line Agencies (previously Ben Line Steamers) is a Singapore-based shipping agency, operating across Asia. As of 2013, the company had over 110 offices and 2000 employees. Ben Line Agencies operates four specific areas: Port Agency, Liner Agency, Offshore Support and Project Logistics services. The company in its previous form was founded in Scotland in 1825 under the name of Ben Line. 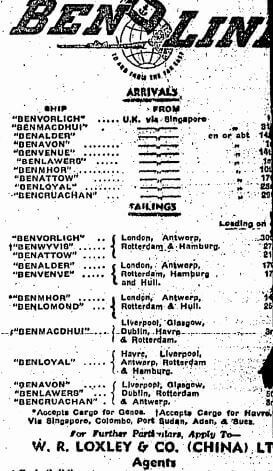 The Ben Line or Ben Line Steamers, Limited was a Scottish shipping company based in Leith, Scotland which pioneered the Far East Europe trade. A private company, it was largely owned by members of the Thomson family from Leith and the Mitchell family from Alloa. 1839 William and Alexander Thomson went into the shipping business as partners, importing marble from Italy and taking coal to Canada returning with timber. From 1859 the company operated routes to Singapore, China and Japan and this became its major source of business. By the mid-1880s New routes had been established to the Baltic; the Canadian trade had run down. 1919 Name changed to Ben Line Steamers Ltd.
By 1927 the Baltic trade had ceased. 1972 Formed the Ben Line Ship Management Ltd with Galbraith Wrightson Ltd in 1972. 1976 Took over the Sheaf Steam Shipping Co. Combined with East Asiatic Co., Copenhagen, to run a weekly service to the Far East. gracesguides Home Page Grace’s Guide is the leading source of historical information on industry and manufacturing in Britain. This web publication contains 107,736 pages of information and 149,663 images on early companies, their products and the people who designed and built them. This article was first posted on 29th October 2017.